The other day I was looking at a giant pile of old innertubes sat in the corner of the workshop, I figured that there must be something better than to just throw them in the bin! My girlfriend already made a few bags last year from old tubes, they worked out really well and were popular with her friends, and in the past I have made juggling balls from them they work well but are a bit heavy. 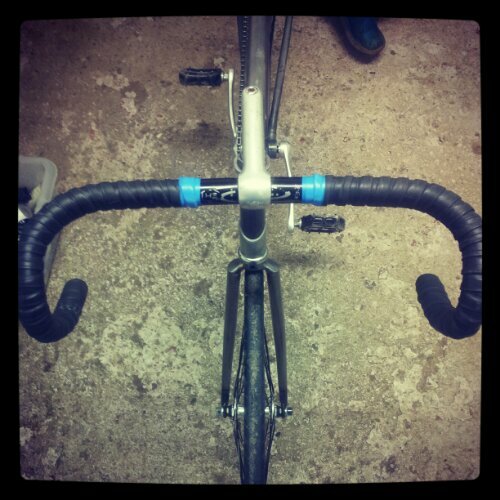 I then had the perfect idea for them….handle bar tape! The tubes are perfect in every way! Stretchy, grippy, comfortable and best of all waterproof! I strapped some on to my Dynatech and its awesome! I urge you all to try and re use as much as you can for what ever you can use it for…you will feel better for it!